Pipe Fabricators (10 Nos) Mechanical Eng. (Construct on MEP exp) LEADING GROUP OF COMPANY IN QATAR (3 Nos. Gulf exp.) 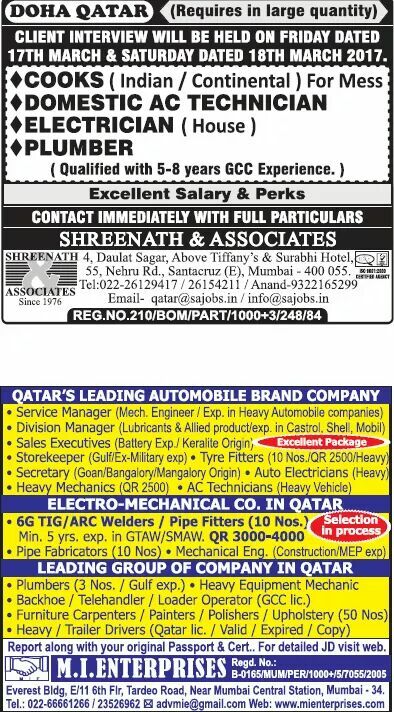 Heavy Equipment Mechanic Backhoe Telehandler Operator, Carpenters Painters Polishers Upholstery (50 Nos), Heavy Trailer Drivers (Qatar lic. Valid Expired Copy) Report along with your original Passport & Cert For detailed JD visit website M.I ENTERPRISES Everest Bldg, E 11 6th Flr, Tardeo Road, Near Mumbai Central Station, Mumbai 34, 022.66661266 23526962 B gmail.com Website www.mienterprises.com.